Yvonne M. (Glasgow) Stegall is filled with creative bones. She is a writer, poet, published author, crafter and artist. Her muse varies depending on her mood. 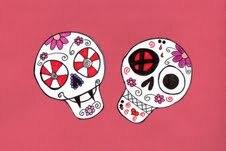 Yvonne’s Day of the Dead art collection was inspired by her love of sugar skull art and Halloween. She did a series of 16 different skulls using mixed media (coffee, colored sugar, marker, crayon, colored pencil and water colors). She plans to do more Day of the Dead art in the future, and possibly some with acrylics.